So as I mentioned in the "The girl behind the blog" post, I'm a bit obsessed with wedding gowns. This comes with dreaming about weddings (not our future wedding, just in general) and the beautiful photo-ops. I'm not dreaming about just any kind of wedding, I'm a huuuuge fan of Disney themed weddings. Many girls plan their dream wedding for fun and even though I don't want a big fancy schmancy wedding, I'm still guilty of dreaming about our (non-existant) wedding. The thing about my ideal wedding is that I want a small event with a few guests (close family & friends), but Disney doesn't really go hand in hand with small and simple I guess. Still, when thinking of my dream wedding, a BIG extraordinary event isn't something that comes to mind. I'm going to try and assemble that ideal wedding without going over the top (HA!). 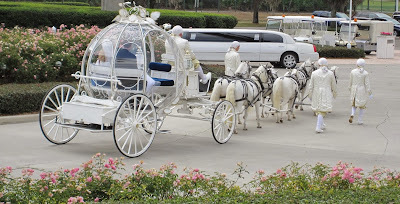 I once before used the Disneywedding designer that can be found on the Disneyweddings website to see what a simple wedding at Disneyworld would cost. We obviously can't afford it (yet), but it's always fun to look at all the options. You can't get married at WDW on a small budget, which was silly of me to think that was possible. Now I'm going all out on this wedding designing thing; I'm going to design my ACTUAL dream wedding with all the bells and whistles. This is where the idea of a small, intimate ceremony stops, I guess? So today is your lucky day, since you're virtually invited to take a look at my dream wedding (aka the wedding we'd have if 1)we'd be billionaires 2)I'd be in charge and my boyfriend would be okay with anything). Welcome to Walt Disney World, Orlando, Florida, USA! I've chosen Walt Disney World, but honestly I have no idea why. Disneyland's Californian climate might be more suitable, but I think there's more opportunities at WDW so I guess that did it for me. We once talked about the number of guests we'd probably have at our wedding; he already has at least 9 family members, I have at least 5 family members. Since the 'budget' selections only allow up to 18 guests, there wouldn't be room for close friends and people we get along with at work (though I don't think I would invite anybody from work). So I'm going for the "Wishes Collection Wedding". The evening starts with the reception at Disney's Wedding Pavilion. This wasn't a difficult choice as there were only two options that I had my heart set on: Sea Breeze Point - Boardwalk Inn and the Wedding Pavilion. There would be a photographer to capture every moment, a videographer so we can relive our wedding over and over again, and of course we'd have a Theme Park portrait session (because who doesn't want to have a portrait in their wedding outfits in front of the castle). We leave the reception area to enjoy dinner (buffet-style) at Disney's Grand Floridian Resort Ballrooms. The music will be provided by either a band or a DJ, I have no idea which is better. To keep the kids entertained (myself included) we'll be joined by some Disney characters. Last thing on the list: a private fireworks viewing to end the celebration. Afterwards we take off to our honeymoon suite and fall fast asleep as we've been awake for too long. I noticed some differences in planning possibilities between the Escape and the Wishes package. Escape allowed more detailed planning, which I missed with Wishes. I suppose if you'd want a detailed planning within the Wishes package, you'd have to contact the Disney's Fairy Tale Weddings Team. Which is perfectly understandable, but a bit annoying for someone who wants a good price estimate without having to go through the hassle of making calls if you're not even sure what you want just yet. Following details were available for choosing in the Escape package. Flowers: bride bouquet & groom boutonniere, bridesmaids bouquets & extra boutonnieres, corsages, floral accents (Swarovski crystals to enhance the bouquet & boutonniere, brooches), accessoires for flower girls & ring bearers. Photography: detailed description of what's already included + several extra options such as album upgrades, package upgrades, extra photo books, gallery wrap of your favourite picture, selection of portrait sessions, selection of videography packages. Entertainment: detailed description of what's already included + extra options such as additional solo musicians, a Major Domo (basically a fancy ring bearer/emcee for the rest of the event), small selection of Disney Characters. Cake & champagne celebration: small selection of wedding cakes and enhancements, small selection of champagne, beverage options (soft drinks, juices, water, extra champagne). 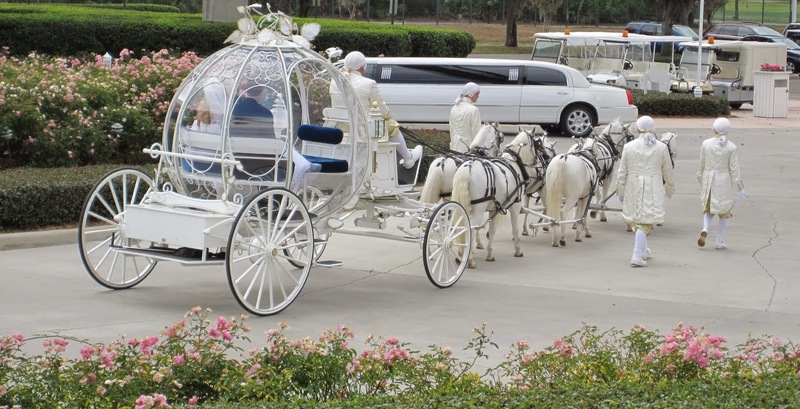 Vehicles: short description of included transportation (in this case "a 4-hour Limousine charter is included with the Escape Collection to take you to and from your ceremony") + options to change transportation: Cinderella's coach, Landau coach and a selection of vintage cars. There are some things I'd like to have that obviously weren't available in the options they provided. I'm just going to list all of the extras I want to have at my dream wedding. Photobooth, a nice way to give the guests an extra memory to take home with them. Photo book, 30 prints 5" x 7"
Two Gallery wraps, 16" x 24"
Transportation: either Cinderella's coach or Vintage 1948 Cadillac. That's about it, I think. The extras are mostly about making memories and not about having a huge party. 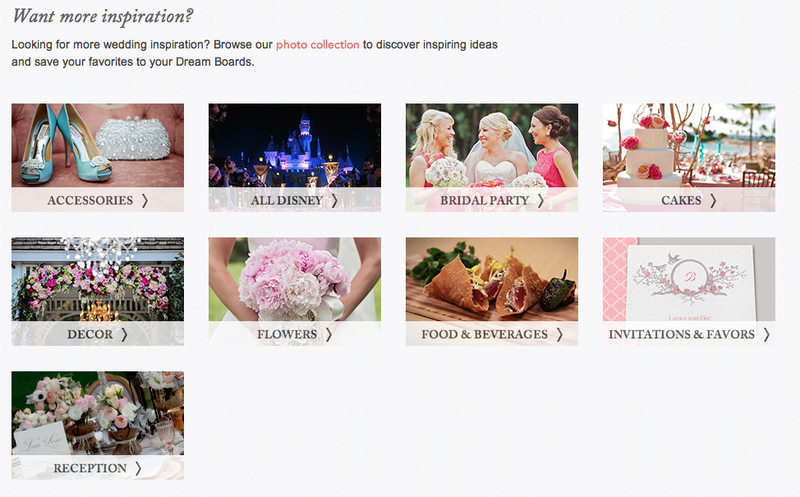 I love how they have a kind of Pinterest space with several categories, so you can create your own boards. Makes dreaming of that special day even easier. It also comes in handy if you know what you want, but you need one place to store all your ideas. Then again, I guess everybody knows the logistics of mood boards and Pinterest, so I'm just going to wave goodbye for now. Do you know anybody who got married at a Disney theme park, or are you having/did you already have your own Disney Fairytale? Let me know down below.